Ah, you know…hormones. At my age, I hear this all the time. I say it myself. It’s the reason we are hot, the reason we are cold, the reason we are wet, the reason we are dry, the reason we can’t sleep, the reason we can’t wake up. Many women my age feel like a hostage to hormones. If you need to take back your body, you will find much to consider in this book . Stanton addresses diet, exercise, stress, supplements, and, most importantly, bioidentical hormones. The book’s design and writing is about as exciting as a Wikipedia article. But the content is helpful. Bioidentical? Huh? 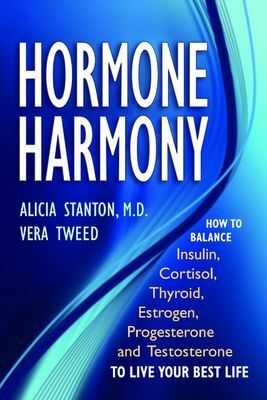 This neologism describes a “hormone [which] is exactly the same as a hormone made by our bodies.” This is different from conventional hormone replacement therapy. And we have just tripped off the path of traditional medicine onto the scenic bypass of alternative medicine. In other words, (lean close to me so I can whisper) the FDA hasn’t approved bioidentical hormones. Yes, there is controversy. Google “bioidentical hormones” and you will dance your way into the debate. May I tell you my story? Purely anecdotal evidence, but it’s my anecdote. I’m not a physician, but I’m a pretty good reader. When the hot/cold/wet/dry problems began—roughly seven years ago—, my most pressing problem was an utterly deflated outlook on life. I woke up, took a shower, and wanted nothing more than to go back to bed. Stanton discusses this in a section delightfully titled NOT YOUR MOTHER’S MENOPAUSE. Initially, many women notice they have less energy or zest for life. or just don’t have the energy to do things they used to enjoy. One day follows another, but none of them brings much joy. for reasons that, in retrospect, seem ridiculous. My respoonse to problems is to read. Shoot, my approach to life is to read. I looked through the lenses of both traditional and alternative medicine, searching for some sense. Across the spectrum, three words flashed: diet and exercise. No one argued with basic stuff like drinking more water and taking a walk. And I firmly believe that so many problems we blame hormones for can be corrected with real food and real movement. I work for a compounding pharmacy; I am an accountant and cannot pronounce the drug names. But, we have a library of books and CDs (where I got Hormone Harmony ) that we lend out to physicians and customers. I took John Lee’s What Your Doctor May Not Tell You About Menopause . When I read parts aloud to my husband, he dismissed it as rubbish. But one Sunday afternoon, we listened to Dr. Lee speak and his words filled us with hope. “Let’s do this,” Curt said, although all the “doing” was mine. So I began using an over-the-counter bioidentical progesterone cream. Because of my symptoms, my doctor had urged surgery as a solution. Well. He hadn’t urged surgery, but I’ve been longing to pair up that delicious pair of words. The big H. Take it out and be done with it. It made sense to everyone but me. I acknowledge that I have issues: my mom died immediately after a minor gynecological surgery. I wasn’t hysterical, but I refused to consent to a hysterectomy, to use another phrase I’ve tasted these many years. It wasn’t a shazam! solution, but I made progress with progesterone. I knew my OB/GYN would raise his eyebrows when I disclosed this bit of information. “I think you are wasting your money,” were his words. I decided to push back. “Are you telling me not to use bioidentical hormones? Because I want full cooperation between us; if you say to stop I will either stop or I’ll find a different doctor.” I respected him and don’t believe in doing stuff—medically speaking—behind my physician’s back. He shrugged and relented. After a few years, I did my own experiment. I stopped the progesterone. The hot/cold/wet/dry symptoms came right back. That convinced me, and I continue on, with over the counter progesterone (which doesn’t require an RX to buy). Ideally, one should take a $150 saliva test that tells exactly what your hormone levels are. A physician or nurse practitioner uses that data to prescribed an individually formulated compound prescription for you. If you are curious, click on the link above and use the Look Inside! feature. If you type “frequently” in the search, you’ll be able to read a large part of the the FAQs. This entry was posted in Uncategorized and tagged bookreview, health, mylife, quote by alivingpencil. Bookmark the permalink. A friend recommended What Your Doctor May Not Tell You About Pre-Menopause to me about nine years ago, and I starting using natural progesterone cream because I’d gotten really irregular. I used it for a year or two and it helped regulate things, but then I quit because it seemed like my system had balanced itself.Well, I’m a lot older now and I’m having wonkier problems. I think I should read the two you recommend here. Thanks for being willing to write about this. I agree with you about not wanting to go the surgical route — not unless it’s a life or death situation. Thank you, Carol…I think I needed to hear this, too!